Well it sounds like Alison had another day kind of like yesterday. She started out slow and emotional, but finished her therapy sessions strong. We had a family meeting with her care team at Madonna today and they all gave updates on their goals and observations. There weren't any huge announcements - all things we'd heard before. 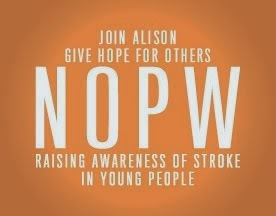 As a family, we're starting to think about what the next step for Alison should be. We'll want to keep her in the highest level of care for as long as possible, but they're always advising us to be preparing for the next step. There are still a lot of uncertainties regarding what exactly our options are and when we'll need to be ready to act. That said, I'd ask that you continue to send positive thoughts and prayers that we would be wise in our decision making on Alison's behalf. Thanks so much.